As the election date is approaching, a lot of people is not yet decided on who to vote. The streets are filled with campaign posters and commercials of candidates have invaded the television channels day by day. I already have my own choice months ahead and have based my decisions on all the forums and debates I constantly followed on TV. It is our responsibility to do our own research because it is our right to ask and to know the truth. Since the national campaign period started, the limelight has been on who to vote come May 10. But what about how to actually vote? We don't choose someone who is just popular, or the choice of the majority, or because we only know of a few things about the candidate. We choose a leader who is honest, sincere, optimistic, God-fearing, hardworking, an experienced leader and full of integrity. For the first time in the country, an automated voting system will be used by registered voters for the upcoming elections. A mock election conducted by COMELEC showed that some voters do not know where and how to cast their ballots. Efforts from various sectors like on-air commercials are being made to be able to reach out to the voters in introducing it—and Krispy Kreme is one of them. The well-loved family brand is out to their own campaign called “Vote 2010: Dough Your Part” and in doing so have devised their own way to help spread awareness. This advocacy campaign was launched on April 29, 2010 at Krispy Kreme branch in Bonifacio High Street, The Fort, Taguig City. This event was hosted by RJ Ledesma, editor-in-chief of UNO Magazine. Krispy Kreme has created a mock ballot wherein voters will choose their winning doughnut and coffee. “We wanted to make it a fun learning experience for the voters. This will help them prepare for the real, automated voting system," says Mark Gamboa, Marketing Manager of Krispy Kreme." The mock ballot of Krispy Kreme will also encourage people to actually exercise their right to vote. 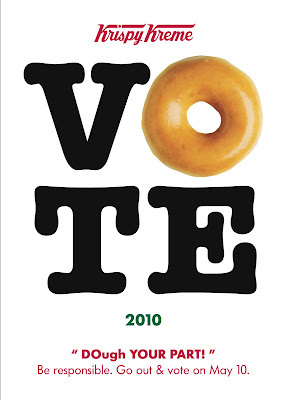 For everyone to further maximize this advocacy, limited edition Krispy Kreme Vote 2010 doughnuts will be available in all Krispy Kreme branches from May 8 to 10, 2010. With this campaign, Krispy Kreme proves itself more than just a doughnut brand. They are also advocates of responsible citizenship. They have shown how doughnuts and coffee became a viable tool to educate Filipinos about the latest voting system. You may visit any of the following Krispy Kreme Branches: Bonifacio High Street, Greenhills Shopping Center Drive-Thru, SM Mall of Asia, Trinoma Cinema Level, SM Megamall, SM Mall of Asia Drive-Thru, Ayala Avenue, Robinsons Galleria, Gateway Mall, Glorietta 4, SM City Annex (North EDSA), Annex 2 SM Fairvew, Eastwood, Marquee Mall Pampanga, SM San Lazaro & SM Manila or call +63.917.8053000. Also, be sure to log on to www.krispykreme.com.ph and be a Friend of Krispy Kreme to get updates.